Hi everybody, Its Wabbita! This will be my 5th Memebox unboxing! Yay! Before my unboxing I will do a quick talk in case you dont know or haven't heard about Memebox. Memebox is the No. 1 beauty box in Korea it comes with 4-8 full size and deluxe samples.They have different kind of beauty box/ theme box to choose from, They have everything from the hair,nail,foot,body,face, skincare and makeup! I mean they have from head to toe products and memeboxes to choose from. If you wanted to try something new, Memebox is for you! Also you have the freedom to choose and purchase any Memebox you want!They don't have monthly subscription at the moment , but trust me once you try it you will never go back to other beauty boxes! You will love it and purchase more!This is the best beauty box I have ever purchased in my life! The price of the boxes ranges from $23- $32 + shipping it depends on what you want to purchase. Most of the product I have received from my previous memebox, were full sizes if not all of them! You get more than the price you paid for the memebox you purchased, It is amazing! Memebox ship internationally in 51 country, If you are interested and wanted to try memebox or for more information about memebox click here . If you want to see what i got from my previous memebox unboxing click here! I also have some discount code at the end of this post if you want to save money, so please continue reading this blog! My quick short talk took forever, sorry I just got excited when i talked about memebox!So lets start my fifth memebox unboxing! This is the #41 Jackpot box. So this is like a contest/you pay for it! But the good thing is they have from 1st place which is you will win $1000 worth of products that you will get on this price and also to 9th place. I remember this box sold out like crazy and the site even crashed or slowed down that some people didn't even get the chance to purchase it. Me on the other hand got lucky and purchased this box! I purchased this box because its obvious that I want to win the 1st prize hehe :) of course who doesn't want that, I think everybody who purchased this box wanted to win the 1st place prize! But I didn't get the 1st prize ;( And my Jackpot box took forever to be shipped well I think it took exactly 2 weeks before I got mine. But for me that waiting time is like forever! I wasn't expecting getting a better prize since mine took forever and I saw a lot beauty bloggers got there Jackpot box first before I even get mine, So in my expectation is I will just get the very last prize like 10th place one and that one didn't even exists! Good thing a beauty blogger that I also follow on instagram and talked to said there is no 10th prize! haha I was so stupid because I was expecting a prize that never existed! So after that I was like expecting the 9th place box which is very interesting and when I got my box it was a surprised and I got the 6th place box!! Look at these its so cute! Its like thinly sliced oranges and lemons! this is interesting item I never use anything like this before it looks like a mini mask that you can put on your face or body.It soothes and moisturized irritated skin and this very convenient and travel friendly you can just put in your bag or purse anytime and whenever you needed. This is so cool. I will try them soon! Oh I just noticed that at the back of the packaging it was written in japanese. Product Description : Enriched with vitamin E hyaluronic acidn and collagen components, The Juicy Point Pads are ideal for emergencies both on your face and body. These point masks will instantly soothe and moisturize irritated skin whenever and wherever needed, plus they come in super adorable designs! How to use : After cleansing, dry your face and stick on a point pad on irritated or dehydrated area of your face or body. Rest for 5 - 10 mins, remove the pad, pat in the remaining essence. Again the packaging is cute! This is really looked like marmalade but not for your bread its for your face! This is also another interesting product to try. Also convenient and travel friendly product, just put in your bag and you have a mask that you can use when traveling. This is another Pure Smile product and also written in Japanese. Product Description : Pure Smile's Gelee Labo series are facial packs with jam like texture made from nutrition- rich fruits and they work to moisturize and soften skin. The orange extracts,hyaluronic acid, centella asiatica , and licorice root extracts complex treats roughened skin texture and improve the skin elasticity. Ho to use : After cleansing, spread the pack evenly over your face, avoiding the eye and mouth area. Rest for 10 - 15 mins and then rinse of with warm water. Another Pure Smile! Maybe this brand is very popular. I am very intrigue about this lip product because it says "Snail Lip Treatment" I never use a product that has snail mucus extracts in it! This lip product is also the very one that i received with snail mucus in it! This product is very unique to me but I heard that using a product that has something with snail mucus is good for your skin. So I am willing to try this! Product Description: Made from various fruits rich in vitamin E, snail mucus extracts,hyaluronic acid, shea butter, and macadamia seed oil, this Lip Treatment delivers instant hydration and nourishment to dry, chapped lips. How to use : Apply a small amount of the lip treatment over your lips whenever necessary. Its highly recommended to use the lip treatment overnight as well. Another Pure Smile product! I am not really too excited about this product. Its just a hand gel,but it is so small that you can put it inside your purse and carry it anywhere, use it whenever you need it. Product Description : Keep your hands germ free with Pure Smile's citrus infused hand gel. Its always easy to forget that our hands are dirtiest part of our body with so many germs and bacteria going trough without ever getting noticed! 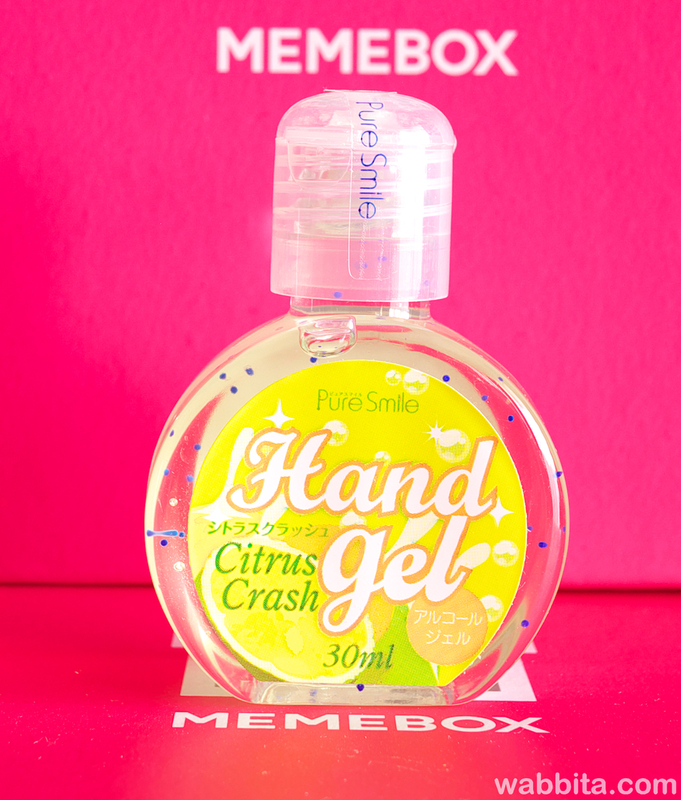 This is super cute hand gel is easy to carry around and the lovely citrus scent will refresh both your body and soul. Ho to use : Apply the hand gel on dry hands and pat it in until all absorbed. Wow! This product is so expensive!! Its $84 for this! Good thing I got this on this box because I don't think I can afford to buy this one. Finally a skincare product!This is my very first IOPE product and I am very excited to try this one!This serum is very light and it absorb very quickly and I also like that this serum is not sticky at all! I heard that IOPE brand are really good brand so I am very excited and happy getting this. Product Description : This boosting serum instantly hydrates the skin when used as first step of skincare routine, preventing any possible dehydration after cleansing. It is also works to maintain just the right balance on your skin strengthening the natural healing power and the moisture lock-in capability. How to use : Right after cleansing, apply a dime-sized amount of the serum evenly over your face and pat it in for full absorbance. Product Description : Enriched with adenosine, ceramide and snail mucus extracts, this Rejuvenating Cream is highly effective wrinkle care product. By deeply hydrating and nourishing the skin, it improves the skin elasticity and minimize stress-instigated aging of the skin. Oh Em Ghee! This product is so huge!! The packaging is really nice and cute too! According to the description this is like a spray for your face that will soothes, moisturize your dry and sensitive skin and also help maintain the skin soft and supple skin. It is very fine when you spray it to your skin.The scent is also like medicinal but not that strong, I actually like the scent its mild. I might use this during winter since I get dry skin but not during summer since I get very oily. I will save this one and use it during cold winter! 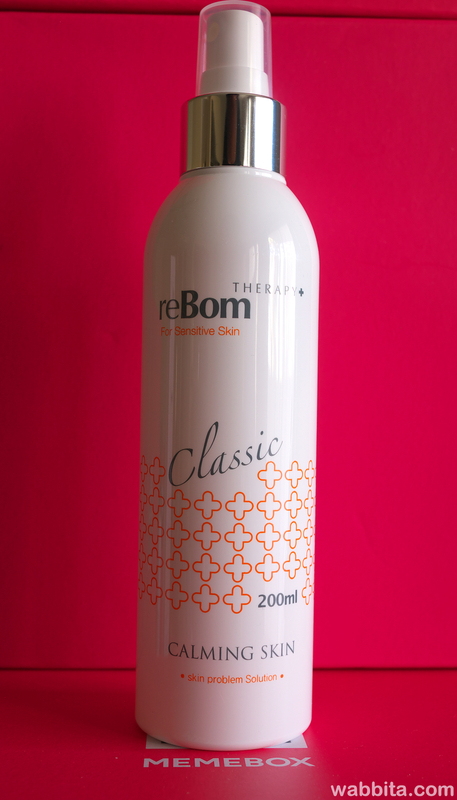 Product Description : Rebom's Calming Skin contains ceramide, niacinamide, and various oriental medicinal extracts beneficial for soothing and moiturizing dry and sensitive skin. Its gentle formula also helps maintain the skin soft and supple. In addition, all of reBom's therapy products are researched and made through a joint research of CNU Laboratory Co., Daejon University Department of Oriental Medicine, and OBM Lab. This is really cool product! Not only will remove your makeup residue but it will moisturize refresh your skin. I like the idea that you don't have to cleanse your face after you wipe this on your skin because its already cleaning it. And its also travel friendly just put it in your bag and you can carry it anywhere and you don't have you carry those cleanse bottle because sometimes those bottles leaked inside your traveling bag so this one is really handy and helpful specially when traveling. I am excited to try this toner, since I am going on a trip soon! Product Description : T.P.O's toner sheet is perfect for quick makeup fix-ups, for removing makeup residues, or even for refreshing and moisturizing dry skin throughout the day. There's no need for double cleansing with this item because it'll quickly and easily cleanse way any skin impurities with just one swipe. How to use : Take out the sheet and gently wipe it across your face. There's no need to rinse off afterwards. This is like a no rinse hair treatment that help your your damage hair, specially your damage ends.I like the idea that you just apply it your hair and you don't have wash your hair and you are good to go. I am interested to try this one! Product Description : For all those damaged hairs out there, the Velvet Nutri-Injection is here to save the day! There's absolutely no need to rinse after application. Simply apply it throughout your hair, especially the damaged ends, after towel drying, and experience results of a hair clinic program! How to use : Squeeze out the treatment and massage it into your hair thoroughly. Product description : The Sulloc Water+ contains 180mg of catechins which are potent antioxidants most active in green tea, 2.5mg of pantothenic acid, and antioxidant level equivalent to 12 full tomatoes.Feel lighter, younger, and more vital with what Water+ has to offer! How to use : drop into a glass o water, mix well and drink. It is best recommend to drink 3 times a day for best results. This is like perfume mist but you can use to your clothes, curtains, bed sheets and car seats! Or basically you can spray it anywhere any fabric that you want to smell nice and fresh. I like this one I also like the scent of this of this one its very mild flower scent. i am absolutely going to use this product. Product Description : Infused with lovely spring breeze-like lily and lilac fragrances, this perfume mist can be use over clothing, curtains, and car seats for refreshing up the scent and for antistatic purposes. How to use ; Spray the Perfume generously over areas you wish to freshen up. First of all the packaging is very cute and second it is so tiny that you can carry it anywhere and use whenever you need some re touch on your lips. I actually got this one already with the same color I wish I got different color but hey I am not complaining. I will keep this or maybe give it to a friend who really like lip product. Product Description ; A richly pigmented and silky smooth lip color that delivers long lasting color stay and hydration for lips minus the flaking or dryness. Its long lasting and waterproof formula dries as quickly as 30 seconds so that you can be ready in split a second! How to use : Sport various looks with this lip manicure! For a gradation look, dad the lip manicure on the center of lips and pat outwards with fingers for a gradually fading look. For au natural look, dab both top and bottom lip with the application tip and tap with fingertips. For glossy look, apply the manicure on lips and add a top coat. This Jackpot box a very good surprised to me! I was expecting something nice but this box is even better! I liked most of the products I got specially the IOPE Serum, reBom Calming spray, the Rejuvenating cream and the lip treatment that has a snail mucus extracts in it and also the Pure smile Point Pads and the No Rinse Toner. Those are the products that i really like and wanted to try, the other products like the lip product, the hand gel , marmalade mask and the hair treatment thing were OK to me. I also noticed that some of the products are travel friendly which I think is really cool and very convenient for people who travel or you just don't want to carry a lot of skincare products when traveling. I also noticed that they put 4 items from the brand Pure Smile, Now I don't know If they put these products because its so popular or they just put it in because they have a lot of items that they want to get rid off from these brand. I don't know , I am not complaining but I wish they didn't include 4 items of the same brand. But hey I got my box on 6th Place so I am not complaining.I really enjoy this Jackpot Box unboxing overall this is a cool box and very different from the other memeboxes i have purchased. I really liked it and I hope that you enjoy this unboxing too! If you want to save some money here are some discount codes for you! $5 off code : WA4M ( one time use only ) any memebox puchase + Sign up to Memebox and get 3 memepoints that is equal to $3 combine it with the coupon code and get $8 discount on your first memebox! These is my affiliate discount code too!